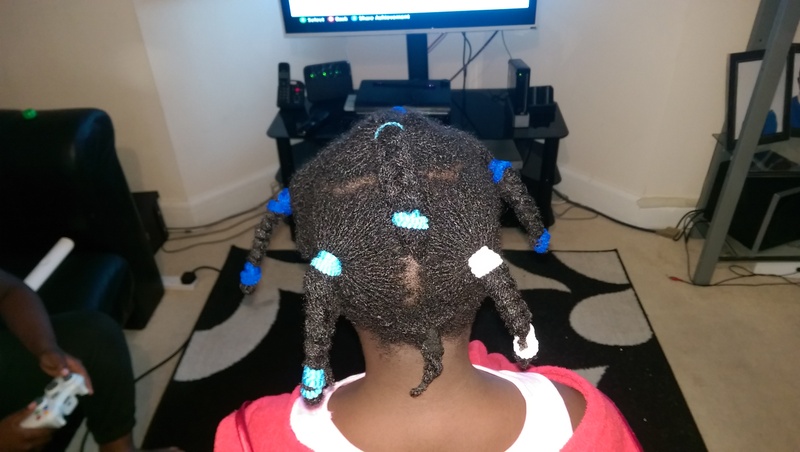 It’s now been 4 weeks since Delaiah’s microlocs were installed and she was due a retightening. This would be my first time retightening her locs and I had no idea how well (or not) it would go, so I was quite anxious to do a good job for her. To get the ball rolling I first washed her hair (Click HERE for my post on washing her locs and HERE for the video) and decided to keep the sections I used from washing her hair as my guide for retightening. I un-banded and un-braided a section and, using my modified plastic yarn needle, I interlocked the roots using the same 4-Point Rotation I used to install her locs. It took between 1 and 3 rotations to retighten each loc depending on how much new growth her loc had. The shorter locs around the nape and hair line had the most slippage (where the locs came undone from the roots) so they took the longest to retighten as I had to redo quite a few of them. But after I repaired those it was quite straight forward from there. I had to ‘pop’ (separate) some of the locs as they were joined at the roots by a few strands. I either pulled them apart or cut them apart using scissors. I combined two locs at the front as one of them was hanging on by only a few strands. I had a spray bottle filled with water handy to moisten her roots as I went along, as the water softens the strands and makes the hair more flexible which reduces breakage. When I finished a section, I sprayed it with my Hydrating Loc & Scalp Mist followed by my Light Loc & Scalp Oil Spray and twisted up the section before moving on to the next. It took me 1 and a 1/2 days to finish her hair. My sister came by on the second day to take over and do a few for me, giving me a bit of a break. The whole retightening process isn’t hard, it’s quite easy actually. It’s just that there are so many locs that it takes a while to complete. It’s going to be important to stick to retightening every 4 weeks as her hair grows really fast and I don’t want to give myself more work by leaving it longer. I’m so glad that I’ve gotten through 1 full cycle of doing Lay’s hair (1 month of night routines, 2 washings and a retightening). Now I know what I’m doing from this point onwards and I’m much more confident that I’ll be able to give her hair the love it needs. Well, that’s it for now. I’ll keep you guys posted with monthly updates so you can see her progress. Keep an eye out for the video I”ll be posting of this soon. How many hour in all did it take? Did you do it non-stop for those days? They look amazing! I really want to microloc my hair and I want to see how long it will take to retighten. It took me about 12 hours on day one and 7 hours on day 2. Yes I did it non-stop. I wanted to know how long it would take if I focused exclusively on retightening. I’ve come across a few people who retighten their microlocs a bit at a time over days or weeks. It’s really up to you to find your own rhythm that works for you. Hello. First of all I want to commend you on your outstanding install, patience and determination. The results are next to perfect. I would like for you to indulge me for one observation. You say you spritz the hair at the root prior to retightening. Please reconsider this. When your hair is wet it is more elastic and pliable. When you tighten the lock it will be locked in a stretched state. My concern is that as the lock matures, this can hamper process. If you have been doing this the whole time it might be ok. He locks appears to be shrinking properly for their age. Your daughter was blessed with an awesome mom and she is one patient little girl.